NATIONAL BESTSELLERA Recommended Book of 2019 fromEntertainment Weekly * O, The Oprah Magazine * Southern Living * BBC * Huffington Post * Lit Hub * Kirkus * Bustle * Publishers Weekly * BookRiot * Popsugar * Bookish * The Boston Globe * The Seattle Times * Vulture * Real SimpleA sweeping and enchanting new novel from the widely beloved, award-winning author Elizabeth McCracken about three generations of an unconventional New England family who own and operate a candlepin bowling alleyFrom the day she is discovered unconscious in a New England cemetery at the turn of the twentieth century--nothing but a bowling ball, a candlepin, and fifteen pounds of gold on her person--Bertha Truitt is an enigma to everyone in Salford, Massachusetts. She has no past to speak of, or at least none she is willing to reveal, and her mysterious origin scandalizes and intrigues the townspeople, as does her choice to marry and start a family with Leviticus Sprague, the doctor who revived her. But Bertha is plucky, tenacious, and entrepreneurial, and the bowling alley she opens quickly becomes Salford's most defining landmark--with Bertha its most notable resident. When Bertha dies in a freak accident, her past resurfaces in the form of a heretofore-unheard-of son, who arrives in Salford claiming he is heir apparent to Truitt Alleys. Soon it becomes clear that, even in her death, Bertha's defining spirit and the implications of her obfuscations live on, infecting and affecting future generations through inheritance battles, murky paternities, and hidden wills. In a voice laced with insight and her signature sharp humor, Elizabeth McCracken has written an epic family saga set against the backdrop of twentieth-century America. Bowlaway is both a stunning feat of language and a brilliant unraveling of a family's myths and secrets, its passions and betrayals, and the ties that bind and the rifts that divide. The boisterous story combines a love of New England history with an eye for the eccentric to create a tragicomic tale that spans 100 years of a family and its bowling alley.... Bowlaway is full of heartbreak, poetry, luck  and a fair bit of slapstick.... The novel pauses to consider the poetry and pain of that particular sentiment, but McCracken has so many elegantly devastating phrases they barely fit in the novel, let alone a review... At its best, Bowlaway achieves that effect, but a few tendrils are left unanchored.... At times a love of quirkiness makes the story wobble, but its generous heart keeps Bowlaway spinning safely out of the gutter. Like a pinbody, Elizabeth McCracken steadies her constellation of characters, and readers watch as fate rolls their way, knocking them sideways, sending them flying into the gutters or skimming past them, missing them altogether.... Bowlaway (her third novel, and first in 18 years) is jumpier, twitchier, a big book that veers in and out of the lives of its idiosyncratic characters, creating what McCracken calls a genealogy, occasionally verging, in its bric-a-brac of historical oddball detail, on the precious. But McCracken's ironic perspective, her humor and her deeply humane imagination never desert her. People who don't yet know the work of Elizabeth McCracken, prepare for delight. If Bowlaway, her new novel (her first in 18 years), presents a fair sample, McCracken's authorly chops fully match their reputation.... McCracken's prose  canny wisdom laid on in swaths of fearless, quirky, galvanizing language  gives consistent joy. Almost every page glitters with quotable treasure.... With this finely wrought, moving saga, McCracken's project is surely big as they come: to convey, in a kind of parallel universe, the poignancy and mystery of human effort; how we handle what we're given. McCracken, who's originally from Boston, clearly embraces this thematically rich peculiarity of candlepin bowling, along with its other quirks, as she centers her multi-generational exploration of one sprawling family on its history with the sport.... The cast of characters is large, but thanks to McCracken's skillful characterizations, they're all unforgettable in their singularity, and her big-hearted canvas embraces them all... Throughout, McCracken stays true to what she writes near the novel's opening: Our subject is love because our subject is bowling. Love persists, despite everything, as does the spirit of Bertha Truitt, whose wild, entrepreneurial spirit continues to reside in those whose lives she touched. Elizabeth McCracken's first novel in 18 years, Bowlaway," is that most improbable of literary phenomena: a buoyant, joyful, rollicking yarn of sadness and loss.... McCracken's gloriously vibrant and boisterously surprising narrative voice is one of the great triumphs of Bowlaway."... These are linguistic gems, little flashes of preciousness lighting up the text. And they give the book a slightly maniacal momentum, as though anything could be reconfigured into material for a funny comparison.... With all of this skill and charm, however, Bowlaway" somehow doesn't move profoundly in the way McCracken's earlier work does.... But if Bowlaway" is never thoroughly engrossing or wrenchingly emotional, it is a tour de force of magnificent sentences, arrestingly strange images, and penetrative observations. Swerving madly in all directions, with a sparkly surface trying to light up its darkness, Bowlaway" is like a train off the tracks: breathtaking as a flash-bulb, breaking new ground, but not reaching any destination. 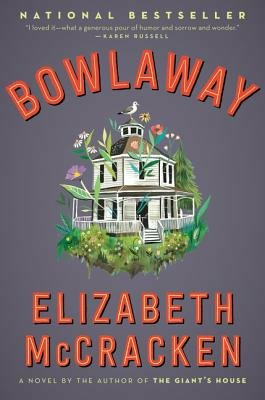 Elizabeth McCracken's new novel, Bowlaway, is a paean to candlepin bowling, a less-whacking variant of the sport.... Bowlaway is a large and caterwauling sort of opera buffa, packed with outsize characters  some with recherch� talents  and wild, often dreamlike events. If this novel were a bar, it would be the kind of joint where the Christmas lights are left on all year long.... More than one woman in this novel has lost a child. The writing on this topic makes for close to unbearable reading.... In the manner of John Irving and Salman Rushdie and Annie Proulx in their less persuasive work, McCracken in Bowlaway comes close to writing caricatures instead of characters. That this ambitious novel nearly works is a testament to her considerable gifts as a novelist, her instinctive access to the most intricate threads of human thought and feeling.... The plot has many resonances but never fully sets its hooks in us.... This novel's cast grows epic, but McCracken is always most impressive when she works small, when she is describing movie kisses or corsets or simply loneliness and longing. I am quoting as much as possible so that readers can decide for themselves how they feel about writing like this. To me it goes down like treacle and quickly becomes indigestible.... Bowlaway is ersatz history, dressing up contemporary values and concerns in period costume. In its singsong quirkiness it reminded me of Erin Morgenstern's The Night Circus and Karen Russell's Swamplandia! If you like those books and you're a fan of the lanes, you may be the target audience. ...superb... Let's be honest, reader. Bowling away trouble is not possible. Trouble is the direct result of existence. But this truth does not stop the memorable characters in Bowlaway from flinging themselves toward heartache, despair, danger and love like so many balls barreling down the alley.... Like all of McCracken's work, Bowlaway is sharp and funny and tragic.... Author of two other novels, two story collections and the shattering memoir An Exact Replica of a Figment of My Imagination, McCracken is a generous and gifted writer.... She's a master at contrasting comedy and tragedy, and Bowlaway crackles with her ironic wit. [T]he tone of "Bowlaway" wobbles like a knocked pin that might fall toward comedy or tragedy. There's a wickedness to McCracken's technique, the way she lures us in with her witty voice and oddball characters but then kicks the wind out of us. She never misses the infamous 7-10 split, managing to hit Annie Proulx and Anne Tyler with the same ball.... Few authors capture as well as McCracken does the way ruin and relief can strike a soul at the same moment. So much excellent writing about and so many wonderful claims for bowling appear in the book that one would not be surprised if its publication produces a spike in alley revenues.... Reading Elizabeth McCracken � the gorgeously-put-together sentences parading the pages like models on a Paris runway; the crazy, original insights; the definitive, wholly fictional pronouncements � is like going on an automotive safari. Most of the attractions are by the side of the road, so there's not much hurry to move along. In fact, to continue with the animal metaphors, the novel is a shaggy dog story within a shaggy dog story within a shaggy dog story. I never felt all that invested in the plot, but I could not stop reading, either, just to see what the heck she would think of next.